KnightED Talks is a professional learning initiative for teacher candidates – students enrolled in teacher education programs. This initiative supplements teacher preparation provided by coursework and field experiences. It enhances the quality of UCF’s initial teacher certification program, contributing to the development of credentialed teacher education graduates, and increasing their marketability in today’s job market. KnightED Talks underscores the importance of professional and personal growth in becoming a highly effective educator. What are the KnightED Talks workshops? The KnightED Talks workshops, offered throughout the fall and spring semesters, provide teacher candidates with regular professional learning on topics of relevance to the teaching profession. The workshops, which are an hour long, are conducted by university faculty and K-12 educators who have expertise in areas of interest to students aspiring to become teachers. The workshops, most of which are highly interactive, have been very well-received by students. Students benefit from the additional preparation they receive to meet the increasing demands of the teaching profession. They also receive workshop handouts and instructional materials that they can add to their ever-growing resource files. Finally, the experiences afforded them by the workshops can be added to their resumes and job interview portfolios. How do I register for the KnightED Talks workshops? Unless otherwise specified, no pre-registration is required; simply show up, learn, have fun, and gain experience to add to your resumes, professional portfolios and teaching credentials. The Showcase is a forum for students to share their best work with their peers during a 45-minute session in an in-house conference venue. This professional development opportunity enhances students’ scholarship and presentational skills. Student presenters engage in a mentoring relationship with faculty as they progress through all steps of the presentation process – from brainstorming a presentation topic, to writing a presentation proposal, to honing one’s presentation, to presenting at the Showcase. This experience, which can be included on one’s professional resume, shows initiative and a desire to be a lifelong learner – attributes highly valued by future employers. What are the benefits to student presenters in the KnightED Talks Student Showcase? Learn the process of submitting proposals for a professional conference. Participate in a “live” professional development experience. Gain experience that can be included in professional portfolios and resumes. Qualify for a $500 scholarship that will enable the recipient to attend a professional conference (available to undergraduate students only). What are suitable topics for a presentation? Strategies or activities learned in classes, workshops, internships, field experiences, etc. How can I get involved as a presenter? Refer to the KnightED Talks Student Showcase Presenter Handbook. If possible, attend some of the fall KnightED Talks workshops on presenting at the Showcase and how to write a proposal to present at the Showcase. How do I participate as a Sponsor or Vendor? We welcome the communities support and participation in KnightED Talks Student Showcase. For more information on becoming a Sponsor or Vendor, please email ccieevents@ucf.edu. KnightED Talks is dedicated to the professional development of UCF’s teacher candidates. The KnightED Talks Student Showcase Undergraduate Scholarship, awarded during the Closing Session of the Showcase, enables KnightED Talks Student Showcase undergraduate presenters to progress to the next level of professional development – attending a professional conference in the field of education. Two KnightED Talks Student Showcase presenters who demonstrate a high level of commitment to professional development in education will each receive a scholarship to attend a state educational professional conference of their choice. The scholarship covers conference registration, lodging, and travel up to $500. Interested undergraduate student presenters will have access to submit the scholarship application upon registering for the Student Showcase (be sure to check that you are registering as a presenter to receive an email with the proposal submission link). The packets will be reviewed by the KnightED Talks Scholarship Committee. 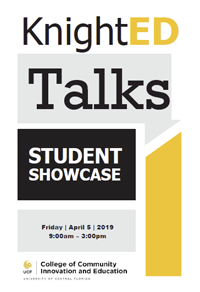 The scholarship winners will be announced at the Closing Session of the KnightED Talks Student Showcase on Friday, April 5, 2019.